Juvy Small - $6.99 Only 7 left! While some kids are off pretending to be Luke Skywalker, saving the galaxy from the Empire, your kid was practicing his mechanical breath and Force Choke moves. Let’s face it, some kids are just cooler than other and hey, not everyone grows up to be the good guy. Some grow up to be the bad guy, so why fight it? With this officially licensed Kids Dark Star Wars Darth Vader Costume T-shirt, your child can choose the path of the Dark Side early on. No reason to fight it parents, just let fate take its course. 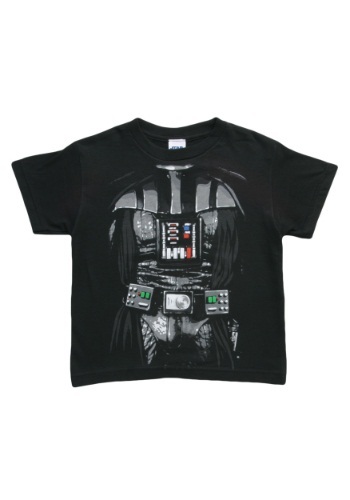 Star Wars is considered one of the best films of all time by some and if your kid is part of that gang then why not snag one of these out of this world tees for them! Your rank for best parent ever is sure to go up, you’re welcome!